PEBBLE BEACH, Calif. (Aug. 19, 2007) - The 18th fairway of Pebble Beach Golf Links® hosted some of the world's rarest vintage vehicles and thousands of spectators Sunday at the 57th Pebble Beach Concours d'Elegance. The Concours competition, which included judging in 24 classes, culminated when a 1935 Duesenberg SJ Special, owned by Harry Yeaggy from Cincinnati, Ohio, was named "Best of Show." The winning car, also known as "The Mormon Meteor," is a supercharged speedster that was raced by Utah's Ab Jenkins (the former mayor of Salt Lake City) and then driven on the city streets. 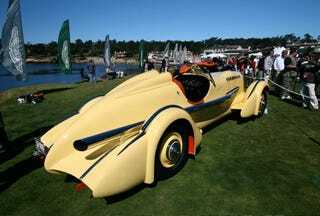 The car, which set a 24-hour speed record (135.58 miles per hour) in 1935, sold for a record $4.45 million at the 2004 Pebble Beach Auction conducted by Gooding & Company. "I'm trying to catch my breath," said Yeaggy on the winner's ramp. "I knew I had a great car. I love the styling and the art deco look, and it's a performance car. It's just elegant from every different direction. For me to get a performance car and a beautiful car is a perfect combination. In my opinion, this is the most significant American car ever built. "I'd also like to give loads of credit to Chris Charlton, who did the restoration work."